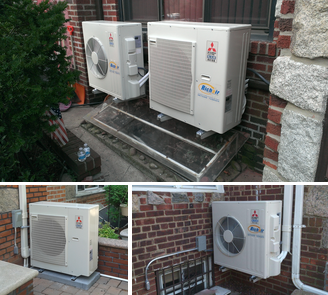 We install ductless mini split in Queens, New York, and offer professional service, including wall-mount, concealed mini split systems, low wall mount ductless units and other configurations. Fully insured and licensed, our Mitsubishi Electric‘ certified technicians have proven their knowledge and skills by passing annual specialized certification tests. Get a quote for a ductless mini split system, schedule your own in-home consultation. We need to see your home! Other HVAC contractors rush to give an approximate price, a ball park that is very confusing to a homeowner, and wrong almost every time. Price depends on many factors: system capacity, configuration, location of indoor and outdoor units, complexity of installation and homeowner’s preferred choices (every family has it’s own preferences). We also need to check your home’s heating and cooling requirements, and discuss your needs in person. Only then will we be able to offer the best solution and free quote for a ductless mini split system. “…there was absolutely no pressure to buy, they did not rush me. Indeed, it is your home, you make the decision! “Yes” is great, but “No” is an absolutely good answer. In case you experience any difficulty, you can always call us at 800-590-1557, we are here to help Monday through Friday 8am-5pm, and Saturday 8am-1pm (we are open Saturdays from May 1st to August 15th only).